Real-time magnetocardiogram measured with a HTS magnetometer at 77 K inside a magnetically shielded room. Biomagnetism refers to the measurement of magnetic signals produced by biological systems, mainly the human body. The source of these signals are either magnetic materials in the body, e.g. magnetized lung contaminants, or ionic currents in nerve and muscle cells. Because of the weak signal strength and the substantial information content at low frequencies, SQUIDs were employed for the measurements already very shortly after their invention. The magnetic equivalent to the more familiar electrocardiogram (ECG) is the magnetocardiogram (MCG) showing the magnetic signal from the heart. 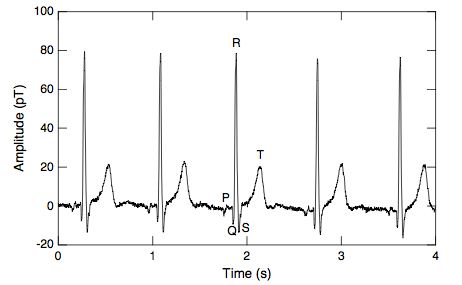 A typical real-time MCG recorded with a multi loop SQUID magnetometer of high temperature superconductors is shown left. 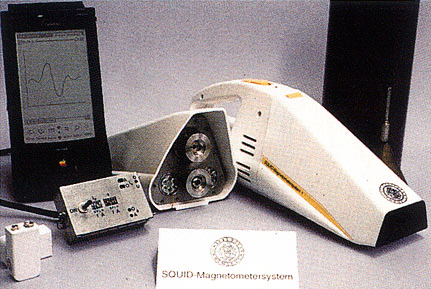 A multichannel SQUID magnetometer system for unshielded magnetocardiography measurements. The copper wire around the wooden frame is for compensation of the earth’s magnetic field. The level of environmental magnetic noise signals is usually several orders of magnitude higher than the biomagnetic signals to be measured. 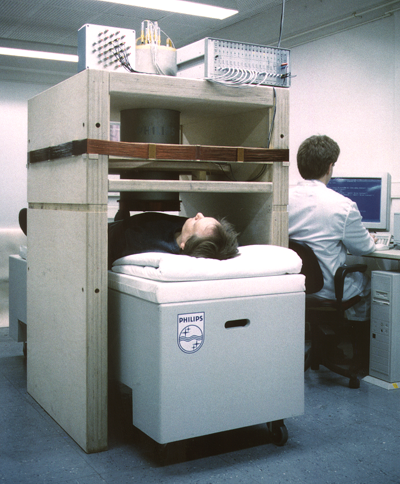 Therefore most biomagnetic systems are operated in heavily shielded rooms. Since the cost for a shielded room can easily take up the major part in the total system cost, biomagnetic SQUID systems will become significantly cheaper, when the operation in unshielded environment is possible. Different noise compensation methods have been investigated with a prototype of a HTS multichannel system for magnetocardiography in unshielded environment, developed at Philips Hamburg. The Figure to the left shows a photograph of this system. Miniature handheld cryostat with HTS SQUID magnetometer for mobile applications. With low-noise magnetometers made from high-temperature superconductors, mobile applications of SQUID magnetometry become possible. Due to the high volume heat of evaporation of liquid nitrogen, a SQUID magnetometer can be operated in a small size cryostat for some hours. The University of Hamburg presented for the first time mobile biomagnetic measurements using an integrated YBa2Cu3O7 magnetometer. It was mounted in a hand-held cryostat with the content of 100 cm3 of liquid nitrogen.